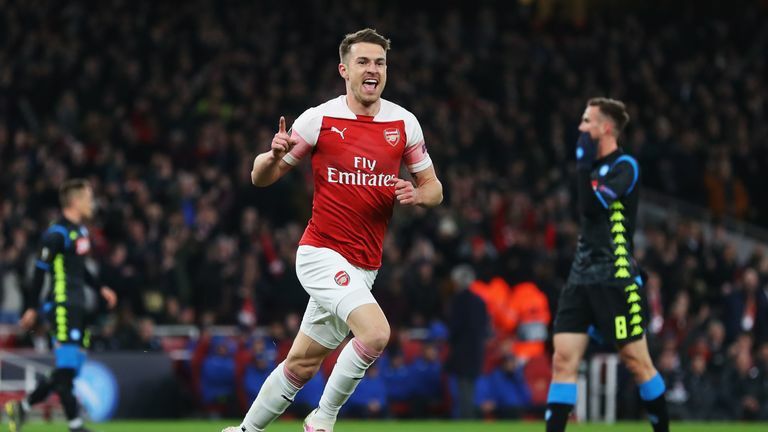 Unai Emery praised an "awesome" display from Aaron Ramsey after he helped Arsenal beat Napoli 2-0 in the first leg of their Europa League quarter-final on Thursday. Ramsey scored the opener in the 14th minute before Lucas Torreira's strike was deflected in by Kalidou Koulibaly shortly afterwards. Ramsey is set to leave the club in the summer on a free transfer to join Juventus after he failed to agree a new contract. Asked about Ramsey's performance, Gunners boss Emery said: "Awesome. I think he wants to do something important with us, to help us do something important because I think he feels all Arsenal. "Here, with our supporters, he gives us more than all he can to do the best performance, not individually but thinking in the collective. "I want to enjoy this moment with him. I want to do something important in this moment with him. His focus now is very big, thinking about Arsenal only." Arsenal could have won the match by a greater margin as they spurned several chances, particularly in the first half when they controlled proceedings. "I'm 60 per cent happy," said Emery. "We know the first leg today was very important to take good results and a good feeling with our supporters. "I think we deserved the result. We controlled the match with the ball and positioning. We can take their box with players and scoring two goals. "We didn't concede a lot. In the second half was different because they pushed more and had more possession. We know it'll be very difficult there, their performances at home are usually strong performances. They'll use all their attacking possibilities against us." Arsenal next face Watford on Monday Night Football before travelling to Napoli for the return leg on Thursday. "They are going to feel different than today," said Emery about the trip to Naples. "We need to be competitive, we need to be strong in our mentality to try to do the same situation we are doing at home. Sometimes, also, when we are with the ball, when we have space, attack this space. Sometimes when we are away, we are some times losing the spirit we have at home. This is our challenge to find success in this season. "We need to be consistent like we are at home, maybe with a different way, or different idea, or different player or a different system, but the same in our mentality."